Something in Between: Semi GlossIf you are still not convinced as to whether you should opt for a gloss or matt finish for your new kitchen cabinets, then maybe a semi-gloss finish might be the best option for you.Semi-gloss cabinets combine some of the advantages from both gloss and matt finish cabinets. They have a degree of light-reflective qualities so light will be bounced around the kitchen. 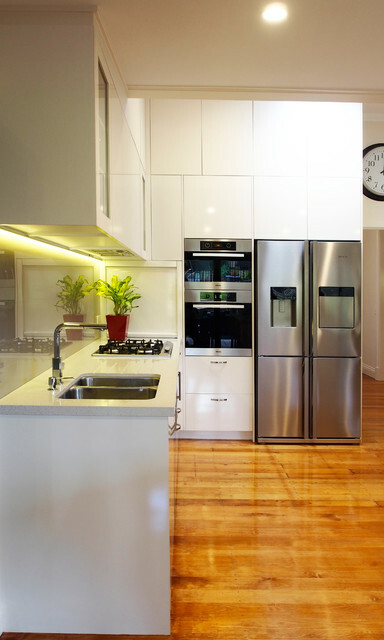 However, because a semi-gloss surface is not as highly reflective as a high-gloss surface, you won’t see as many reflections in your cabinet fronts, and this may give you a more consistent-looking colour. Additionally, you’re less likely to notice fingerprints as easily on high-gloss fronts. A semi-gloss finish is also just as easy to wipe clean as a gloss finish.